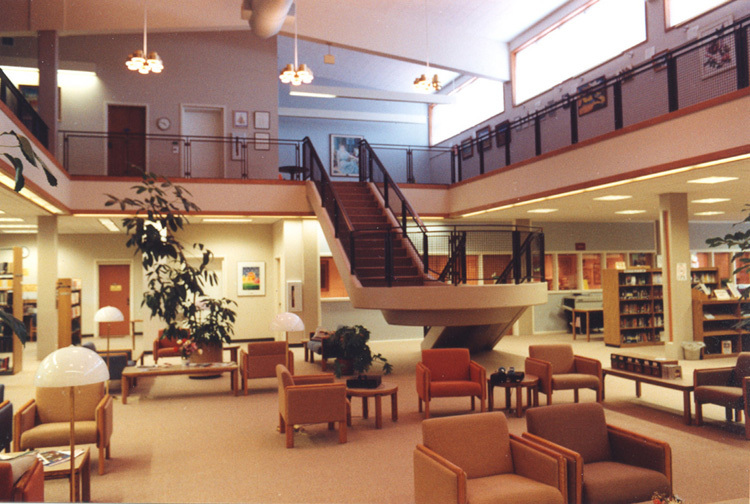 Rapidly growing patronage by the community encouraged the Sheridan Library to expand in 1986, more than doubling the size of the building designed by our firm in the mid-1970’s. The addition includes a two-story reading area circled by a mezzanine which is frequently used as an art gallery. This spacious area, lit by ample natural light, features a cantilevered concrete staircase and enough room to add 30% to the library’s existing shelving capacity. 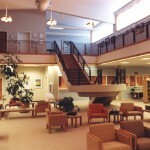 The rail mesh on the stairway and mezzanine provides for patron safety while allowing the library staff to easily monitor the upper level from below. A reference desk, new children’s library with a story-hour theatre, periodical room, community meeting rooms, audiovisual department, and storage accommodation for bookmobile and outreach programs were also added. The former children’s department became a Wyoming history room. The technical services area was completely redesigned to produce a streamlined operation requiring a minimum number of employees.